Rockstar Thinkers uses fun, animated, short videos to teach kids positive habits and strategies to use in life. In a nutshell, it helps kids become the best version of themselves! 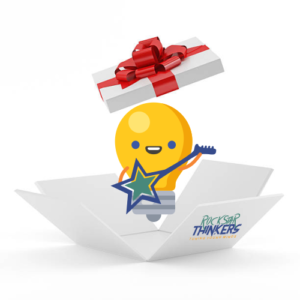 Introductory Offer: Get access to Series 1 (5 videos) of Rockstar Thinkers for one year! BONUS: you will receive access to the next 5 videos free! Easy to understand messages delivered in an entertaining way. Loved the catchy phrases too. I find myself and my daughter saying them at times. With everything kids need to deal with these days, I hope schools adopt this program or that more parents get it for their children. I watched these videos with my daughters age 6 and 11 and they really held their attention from start to finish. They thoroughly enjoyed them. As a parent I find these videos a great teaching strategy to help kids deal with different emotions and I love the message that they provide- a must have for parents and teachers! Loved these videos. Quick, smart and to the point. Pinpointing problem and solution in minutes. Watched them with my little ones and they led to some really nice discussions over the strategies and how they could incorporate them. Should be a staple in schools. Outstanding video. Teaching children how to cope with negative feelings and difficult times in their lives is very important. Even as an adult I find it helpful. It is like a roadmap for navigating the curves and bumps in the road of life. We should have had these years ago. What a simple solution to help children deal with life. Children are taught how to learn, play sports and behave, now how to deal with negative feelings. I would certainly recommend these to people with children. I have watched these videos with my eight-year-old and my 13-year-old. Both couldn’t take their eyes off their computer and by the end of the video were asking, “Can we watch another one?” They were fun to watch, inspiring and informative. From a parent’s and teacher’s perspective, I’ve noticed too many kids today lack confidence, positive thinking and problem-solving skills. These videos can really help them to develop, particularly as they face the pre-teen and teenage years. These videos are such a great learning tool for children to learn how to think positive. I am now a grandparent and wish there were these type of videos for my children. The videos would have been a great influence for them, when they had negative feelings to deal with.